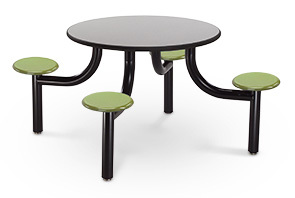 Engineered for superior strength and durability, Max-Master tables are designed for dining halls and dayrooms in correctional or institutional facilities. We're talking serious structure here! The unique leg design is the key to the form and function of this high-performance fixed seating. The curved leg sections are fully welded to the vertical seat supports. The bottom of the vertical seat tubes have fully welded mounting plate insets that hold your choice of either enclosed tamper-resistant anchor bolts or large-stem adjustable glides for a free-standing option. The legs are finished with black powder-coat paint for a tough long-lasting finish. Choose from nine timeless seat colors specifically created to mimic those found in nature and help "replicate" a natural setting in an institutional facility that may (out of necessity) lack natural light and exterior windows. The 13" diameter Super Slammerstone® seats are a high-density, color-impregnated, compression molded composite that's scratch and stain resistant. They also feature four molded-in threaded inserts to provide a superior metal-to-metal connection to the base. Stainless steel finish seats also available to add a little pizzazz to the décor. 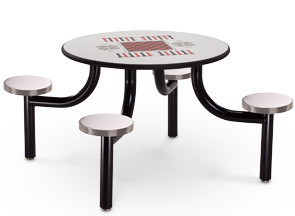 The stainless steel #4 finish seats measure 12" in diameter and are formed of 14 gauge steel. 6" x 6" x 1/4" Thick Steel Mounting Plates Welded on to Support Table Top and Seats. No Openings to Conceal Contraband or Absorb Moisture. Table tops are 42" in diameter with a 1-1/2" thick edge profile and are available in Laminate Titanium Evolve. The high pressure Laminate Titanium Evolve is sealed with a specially formulated highly durable Slammer Stone edge radiused for safety and pressure fused to the top, rendering it permanently non-removable and highly sanitary. The NorStone™ table tops are made of a specially formulated fiberglass filled polyester composite, compression molded under 2,000 p.s.i. pressure to create a seamless, one-piece top and edge surface that resembles granite for superior impact resistance and durability. Optionally, an exclusive game top pattern that includes checkers, chess, backgammon and solitaire is available on the commercial quality laminate table top, and a checkerboard game top can be laser etched into the NorStone™ table tops.